Church And State: Balancing Candidate Beliefs On Air : NPR Public Editor A pair of stories on the religious backgrounds of the presidential tickets highlights an age-old NPR challenge. 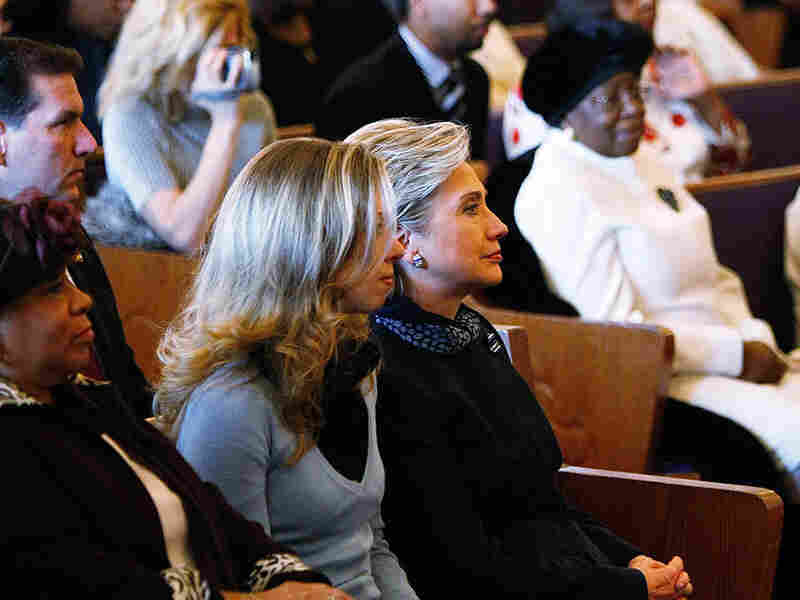 Hillary Clinton attends church with daughter Chelsea Clinton at the Greater Mount Carmel Missionary Baptist Church in St. Louis, Missouri while on the campaign trail in 2008. With the Republican and Democratic party conventions behind us, my office is back to tracking NPR's campaign coverage. We will publish the latest numbers later this week. But, first, a look at a pair of good pieces by Tom Gjelten (it's not just me saying so) on the religious backgrounds of the Republican and Democratic presidential and vice presidential candidates, and why some listeners ended up seeing bias that didn't exist. Morning Edition listeners on Aug. 3 heard Gjelten's reporting on the religious background of Hillary Clinton and her running mate, Tim Kaine. Later in the program, they heard an interview host Steve Inskeep did with Michael Cromartie, vice president of the Ethics and Public Policy Center, about Donald Trump's ties to New York City's Marble Collegiate Church. All Things Considered listeners that same day heard the equivalent Gjelten report about Trump and Mike Pence. It wasn't clear to some morning listeners that they could tune in to the afternoon program to hear Gjelten's second piece. Meanwhile, some afternoon listeners, after being directed to the website to hear his Clinton/Kaine piece, took umbrage. "Why is a report on one side broadcast to all listeners and the [other] side shunted off to the web only?" asked Mark Skertic of Munster, Ind. Karl and Sharon Sipe of Alexander, Ark., felt that this was more evidence that "you have gone too far with the free coverage you have given Trump without equal time for Hillary." No one complained to my office about hearing two pieces about Trump's religious background in the same day, morning and evening, but it raised questions for me. The questions all around underscore the challenge the newsroom faces (and the knots it sometimes ties itself into) as it attempts to treat both sides fairly, an issue it has grappled with for years. And fairness is what everyone involved was trying for, in this case. When Gjelten set out to do his two pieces, (as with any similar NPR stories) the options were pretty basic: Air both pieces on the same day, back to back, or at least in the same show. Air them in the same show on subsequent days. Or do as the newsroom did: Air one piece in the morning and one in the evening. Sarah Gilbert, the executive producer of Morning Edition, wanted her show itself to be balanced, however, precisely because the show and All Things Considered have "very different audiences." So after committing to broadcasting the Clinton/Kaine portion of the package, she said she ordered up Inskeep's interview about Trump's faith background. It inadvertently ended up duplicating, in part, Gjelten's piece later the same day (which is a separate internal issue). What's the right answer? It's not so simple. There is little overlap between the two shows. But not all listeners, many of whom are commuting in cars, hear all two hours of whichever show they listen to, either. So just airing both pieces same day, same show is not a perfect solution. Airing Gjelten's pieces back-to-back would have been the fairest choice. But they were long, at more than six minutes each. That would arguably have made for the least interesting radio experience, particularly for listeners who do not care about the subject. At a minimum, said Edith Chapin, NPR's executive editor, NPR should have been much clearer in how it told listeners about the other pieces. After hearing all the arguments, I come down on the side of airing the pieces on subsequent days, in exactly the same slot within the same show (again for the benefit of those listening on a schedule). That option, of course, presumes that no breaking news disrupts the carefully crafted plans. DeRose pointed out that these kinds of issues do not exist for those who access stories online; on the web pages, links to both pieces are prominent. "We did the best with terrestrial radio that we could do," he said.